Of all the things that could go wrong with your feet, having a toenail fungus doesn’t seem that serious. However, it can make you self-conscious, inhibit your activity (for fear of spreading it), and even lead to open sores on diabetic feet. Fortunately, Parker Foot & Ankle offers new technology to deal with your unattractive nails: laser treatment. But first, let’s look at the very best treatment of all—not getting the fungus in the first place. Keep things clean. Wash your feet every day. Wash your hands often, and keep nails trimmed and clean. Wash towels and sheets in hot water when possible. Keep feet dry. Dry thoroughly after your shower or bath, use powder (antifungal is helpful), and wear socks and shoes that breathe and draw moisture away from your feet. Don’t pick, and be careful when trimming nails. Any time you damage the skin around your nails you leave an opening for the fungus to invade and set up house. Wear foot protection in damp public places. This provides a barrier between you and the fungus. Get rid of old shoes that may have been infected, or treat with antifungal sprays or powders. Treat the skin of your feet, too, if you’ve had an infection in the past. These habits will make it harder for the fungus to find you, but there is no guarantee that it won’t slip through your defenses, so let’s talk treatment. The first is topical medications—cream or gel that is applied to the nail and surrounding skin. In the very earliest stages, they may just work to nip an infection in the bud. Once the fungus has burrowed under the nail, however, they lose effectiveness because they can’t penetrate the hard tissue. The second is oral antifungal medications, which for many years have been your only other option. These are delivered through your blood stream and are a bit more effective than topical treatments, but come with undesired side effects like nausea and the risk of liver damage. You need to have tests periodically while on these medications to make sure liver function hasn’t been impaired. 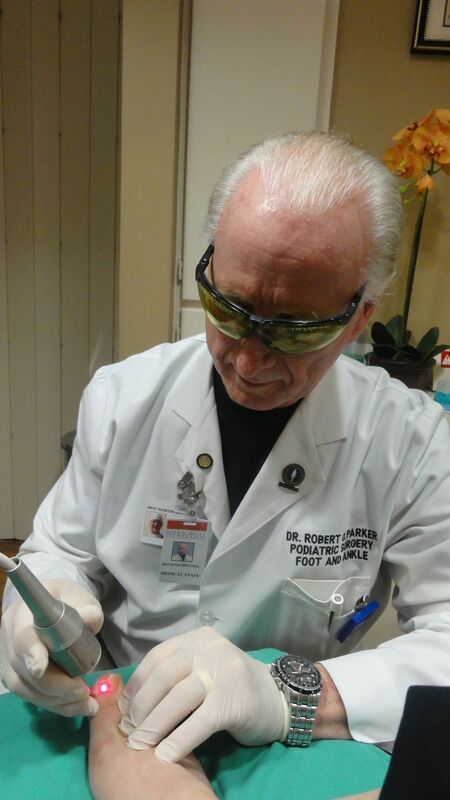 In the last few years, Dr. Robert Parker has pioneered the use of laser treatment for fungal toenails in the Houston area. Our office was one of the first to use this new technology to eliminate the fungus under the nail where it grows. Each new laser is an improvement on the ones before. We are currently using the FDA cleared Fotona laser with great results in 80 to 85% of our patients. This therapy involves focusing intense light beams right on the fungus. Its cells are vaporized and destroyed without damage to the healthy tissue around them. The procedure is quick, painless, has no known side effects, and is done right in our office. We can usually see great improvement with only one to three treatments, although stubborn cases may require a combination of laser combined with short term oral antifungals for complete eradication. Remember, toenail fungus can be a chronic problem, so continue to practice good habits to fight off future infections, and be prepared for a certain amount of maintenance treatment that may be needed to keep your nails clear and healthy. If you are tired of looking at those brittle, funny-colored nails and don’t want to risk the side effects of oral medications, call Parker Foot & Ankle in Houston, TX by dialing (281) 497-2850 and set up your first appointment. You can also request one online using the form on our website. We’ll evaluate your nails and plan the best laser treatment schedule. Soon your new, healthy nails will begin replacing the ugly old ones, and you won’t be embarrassed to show your feet anymore.